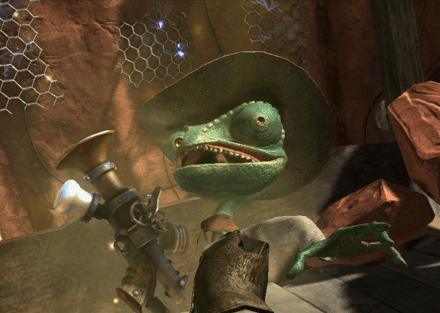 Over the weekend, the kids and I had a chance to check out ‘Rango The Video Game’. We are going to see the movie during a birthday party in a few days, so the kids were REALLY excited to give it a shot. I requested Rango for XBOX 360 because we have a TON of games for the Wii, but the video game is available for Playstation 3, XBOX 360, Wii, and Nintendo DS. The game’s graphics are insane – something that this generation most certainly will take for granted. Long gone are the days of shotty sequences and pixel-like structures. It was almost as if we were watching the movie itself. Really amazing. Here’s a video of the kids giving the game a shot – Liam gets so into it! X X X !! LOL! So what does Rango do? He travels around the Wild Wild West and uncovers treasure, fights zombies, rides bats, has shoot outs and… stops an alien invasion. You know, typical chameleon stuff!! 🙂 We didn’t get too far because we’ve only been playing it for a few days, but the kids were able to maneuver around and do what they had to do for the most part. 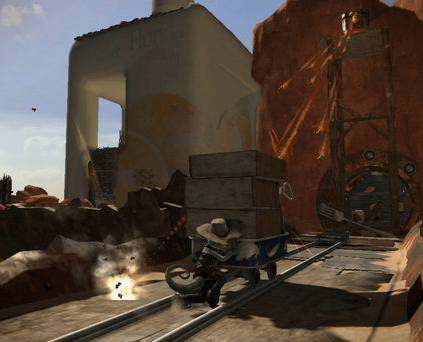 Rango’s All New Tall Tales – Play as the quick-thinking chameleon Rango, the best Sheriff the town of Dirt has ever known, and explore a variety of new missions and environments that expand beyond those seen in the film. Ride Roadrunners and Desert Bats – Speed through the desert atop these unconventional chariots as players engage in extraordinary acrobatic gunplay and more. Interact with the Dirtonians – From a group of mariachi birds that provide color commentary to a gang of wild rabbits, the townsfolk of Dirt will provide no shortage of fun and entertainment. The recommended age for this title is 10+, but as long as you stick around to help out with the harder scenes your kids will be FINE. Truthfully, my 5 and 3 year old just like to walk Rango around and break boxes to collect treasure. That was fun enough. They weren’t concerned with beating the title – it was more about being able to manipulate Rango. I, on the other hand, will play this game when the kiddies are sleeping. I usually play intense titles and this one is a nice vacation from my heavy role playing options. I can’t wait to see the movie because the game is really an extension of the film. It follows the storyline, but also adds more dimension for extra gaming fun. 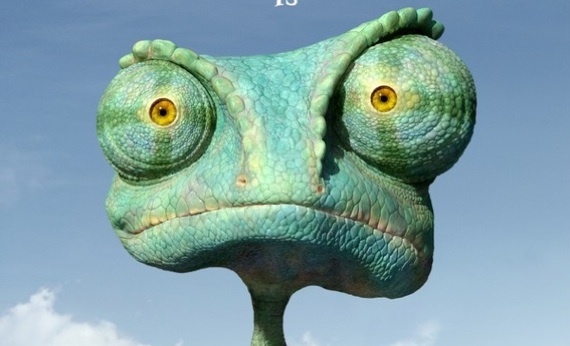 Are you planning on watching Rango? How about getting the game for your kids? This movie looks like so much fun but the game was a blast, thanks for doing a video, I love your fun kiddos BUT more importantly what a great cheerleader you are to your kids!! Looks like a lot of fun! I need to get my toddler a game of his own. This may just be the one. Your kids are adorable, Vera! My daughter is so excited to see Rango! I’m going to run out and find this game for her. I think she’ll love it! I have to admit that we are a game-free family at the moment, but I am really looking forward to the day when my boys will be fighting over the controller! This looks really fun! Wow didn’t know that a game existed for the movie, and I’m going to have to pick that up for my son. He loves this movie so much I think he will love to pay it as well. I have been watching Rango with my son this whole week that loves this movie. I also enjoy having access to thousands of movies and TV shows using DISH online. This even let’s you watch DVR recordings and live TV too. I can watch recordings away when I’m out on the road and I stay at a motel. This is a great way to get portable flexibility on TV. I set this up with my employee service to get the best access to shows. I work late and most things are over so my iPad lets me stream live TV or my recordings. I get access to thousands of movies for rental too.